Over 10 years of designing and programming educational, informational, and entertainment apps, game development, ​corporate presentations, interactive kiosks,​ CDROM development and production, children’s software - expert knowledge of actionScript OOP techniques dynamic applications, data integration - extensive experience in developing web, CDROMs, corporate presentations, kiosks - dynamic expandable data-driven app design - strong expertise in game design and development - large and small scale projects carried through from conceptual design to completion. Here are some samples of my previous projects. I designed UI, UX and developed Jukebox - a kiosk placed in a hardware store to attract and entertain customers. The project was done quite a while ago before iTunes were a standard. Each customer could select a playlist and queue the songs he/she wanted to hear. I developed an algorithm which allowed only 2 songs in a row per each customer. The rest went to the end of the queue allowing other visitors to the store to enjoy their selections. The finished product was installed and used in a hardware store on the Upper West Side in NYC. This is another project where I was responsible for UI, UX and delivering a working prototype. 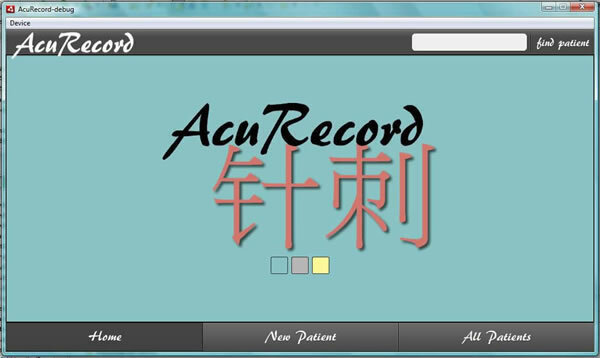 This product was to serve as a patients, records, and visits tracking mobile system for acupuncture offices. Using this product, doctor could use his tablet to register new patient, record each visit. pull up any patient's records from previous visits. Research for the project was done by students of acupuncture who performed user testing as the prototype was taking shape. This was a team project for AT&T children's exhibit. My part of the project was to write software for registration kiosk. When children entered the exhibit space they had their picture taken, and were asked some questions. The information was used throughout the exhibit to make the experience personal and interactive. I did not design the screens but was working with the UI/UX team as a developer. Interactive arcade type game designed to market client’s fulfillment services. User moves a delivery truck with either mouse or swipe gesture across the screen while the ‘orders’ are falling. The goal is to move the truck and catch the orders. I developed the game and deployed it on Facebook, googlePlay and appStore. I did the programming for the kiosk placed in the lobby of NBC studios. Kiosk was playing full screen video of memorable Olympic moments while doing the count down to the beginning of the games. It also served as the Olympic phone directory. I designed and programmed Art Detective CD - a game which engages children in viewing art masterpieces and learning about them. Virtual museum visitor is encouraged to wander from one art gallery to another and look at the paintings. He/she can break any painting into puzzle pieces and either put it back piece by piece or answer the question about the artist and watch the painting become one again. Picture Story Maker game was a part of “Readio” project: a virtual world populated by characters from the books children read. Custom voice recognition mechanism was used to make reading an interactive and engaging experience. The more books child takes from the library and reads, the more characters enter his play environment. I was a part of engineering team responsible for developing Picture Story Maker. This game was designed to make a frame-by-frame picture story with backgrounds, characters, items and quotes which child "earned" by reading. The more he/she has read, the reacher his virtual world has become. The items were stored on the server and obtained dynamically by the game. Star Trek: Klingon comes with three CDs (the main feature being called "Immersion Studies"). The third CD contains the "Klingon Language Lab", which is a compilation of all the grammatical rules and words that were invented for Star Trek and a condensed version of Power Klingon, an audio course on the Klingon language that can be played in a standard CD player. I was part of the engineering team on the project and programmed the third CD - "Klingon Language Lab".